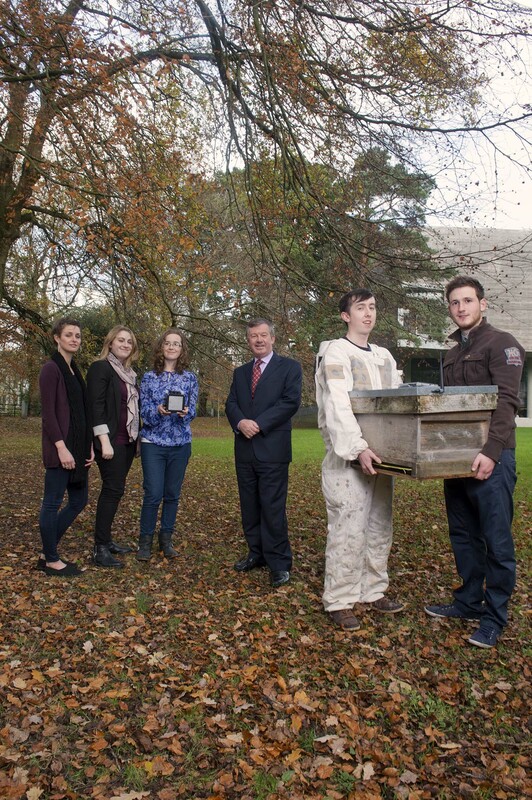 Dr Michael Murphy, President, UCC with students L- r Lily Pinson, Fiona Edwards Murphy, Katie Hetherington, Liam O’Leary (in bee keepers suit) and Killian Troy. A project using smart technology to help the plight of the humble honey bee has won a global competition for UCC students, including one Clare student, against challengers from MIT/Boston University (2nd) and TU Delft (3rd). Lily Pinson and her fellow UCC students created an energy-neutral smart beehive for the IEEE /IBM Smarter Planet Challenge 2014. The competition organisers asked students worldwide to come up with an innovative solution to a grand challenge facing their community. The UCC pilot project uses big data, mobile technology, wireless sensor networks and cloud computing to look at the impact of carbon dioxide, oxygen, temperature, humidity, chemical pollutants and airborne dust levels on the honey bees, using solar panels for an energy neutral operation. The students’ research will also allow bee keepers to monitor their hives at times that were previously difficult or impossible such as during the night, heavy rain or in the depths of winter. In the competition the student projects had to fit into one or more key areas, including: Big Data/analytics, cloud computing, cyber security or mobile technologies. The IEEE/IBM Smarter Planet Challenge competition is run by the largest engineering organisation in the field, the Institute of Electrical and Electronic Engineering and the prize of €5,000 was sponsored by IBM. The five prizewinning UCC students came from Electrical and Electronic Engineering (Fiona Edwards Murphy, Liam O’Leary and Killian Troy), the School of Food and Nutritional Sciences (Lily Pinson) and the School of Biological, Environmental and Earth Sciences (Kathie Hetherington). The Irish Research Council is funding the PhD of the team leader Fiona Edwards Murphy who is designing a smart beehive. UCC has a great track record in this competition, winning it in 2011 and coming second in 2013. In their creative video entry that won them the competition, the students highlighted that the EU, UN and other bodies have predicted growing constraints on global food supplies and prices, as honey bee colonies, identified as the most important pollinator insect for food production, suffer a dramatic decline. Great project. As a beekeeper I can easily see benefits and uses for this technology. May I suggest you also involve your business department students in figuring out how to roll this idea out to a global market. LMK if you want help. Very Cool and valuable idea… And something that will benefit many as it evolves.. Congratulations from and ibmer !! !